"The eleventh hour of the eleventh day of the eleventh month" famously marked the ceasefire on the Western Front in Europe. Once Germany had signed the armistice, the Allied Powers celebrated. In Greenwich as elsewhere in America, bells rang, whistles blew and people took to the streets in celebration. At the very end of 1918, Americans and other Allied troops marched into Germany. President Wilson arrived in Paris to attend the peace conference which resulted in the Treaty of Versailles signed on June 28, 1919. The War made a lasting imprint. It took many months for American military personnel to return to their homes; what they saw and experienced in Europe profoundly affected their world view. 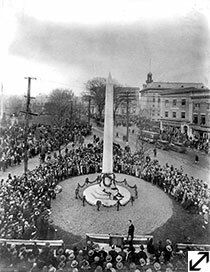 In honor of those who would never come back, people in Greenwich and across the nation created public memorials with an intensity never before seen. They also continued to aid devastated civilians in Europe, although not at the high level witnessed during the War years. 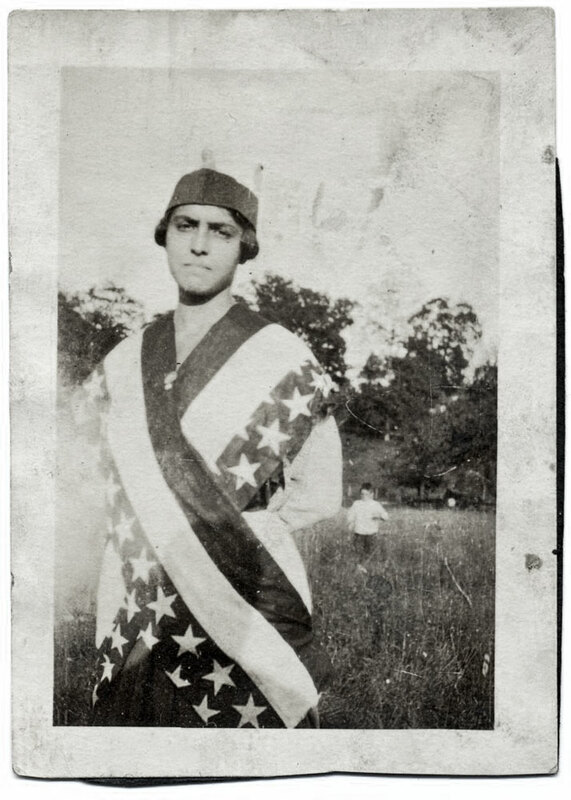 Due in part to their wartime contributions, women won the right to vote with the ratification of the Nineteenth Amendment. The assimilation of recent immigrants would be pursued with even greater urgency as residual concern about political allegiance discouraged ideas of "dual loyalty." America's standing in the world was forever changed. Arrival at Commonwealth Pier, Boston, Mass. Troopship Agamemnon with 26th (“Yankee”) Division boy’s, April 7th, 1919. Formerly German “Liner Kaiser Wilhelm II.” Commercial Photo Shop, George M. Russell Mgr., Lowell, Mass. Library of Congress, LC-US62-52796. The 26th Division included soldiers from Greenwich. 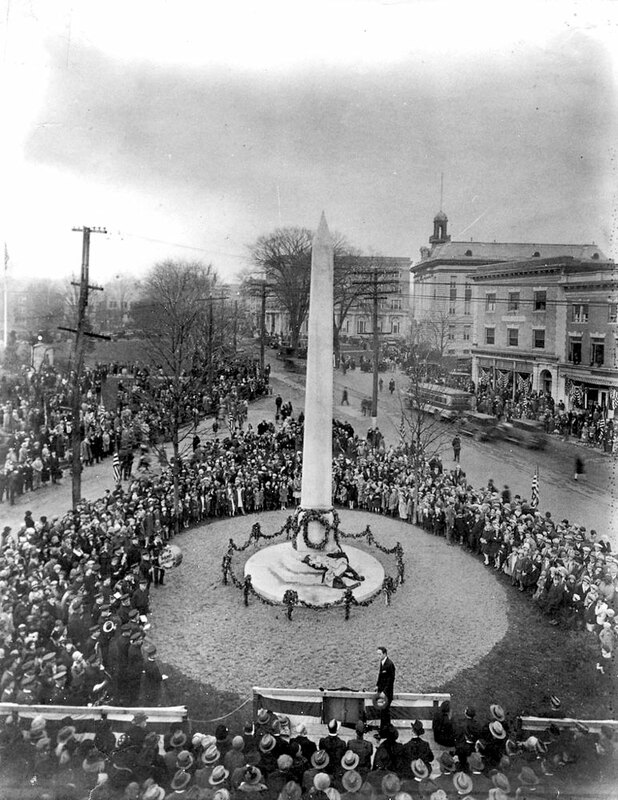 Dedication of World War I Monument in Post Office Plaza, 1925. Original photograph in collection of the Greenwich Library. World War Medal, 1919. The Town of Greenwich Connecticut presents this medal for service in a righteous cause. Designed by Nathan Potter. Cast by Gorham Company, Providence, Rhode Island. Greenwich Historical Society, William E. Finch, Jr. Archives. Gift of William E. Finch, Jr. 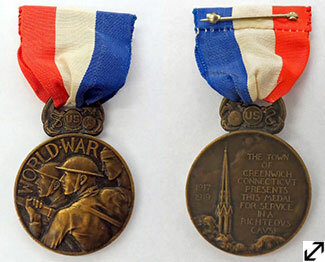 These bronze medals were presented to Greenwich service personnel at a "Welcome Home" dinner dance held on July 4, 1919. 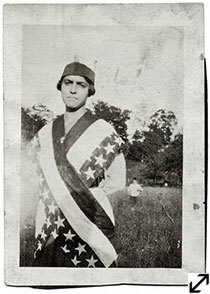 Jennie Cotroneo on Armistice Day, November 11, 1918. Greenwich Historical Society, William E. Finch, Jr. Archives. Gift of Jennie Tropiano. 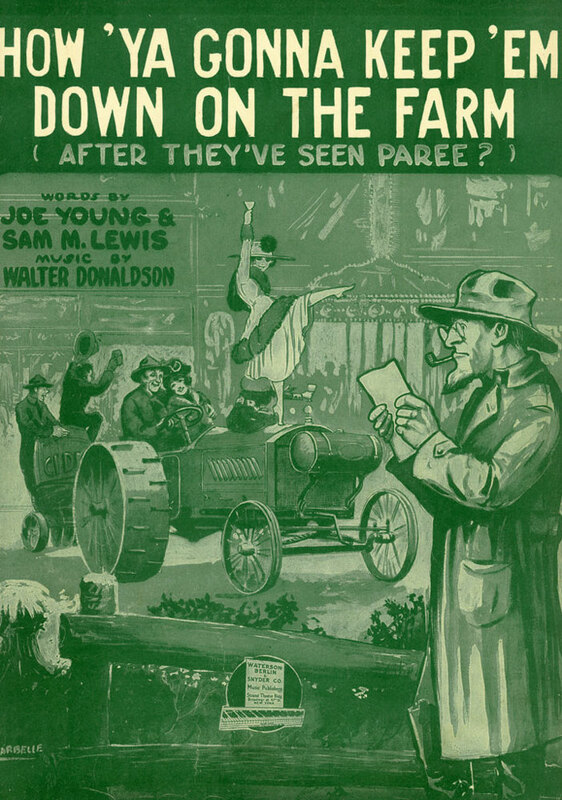 How 'Ya Gonna Keep 'Em Down on the Farm (After They've Seen Paree? 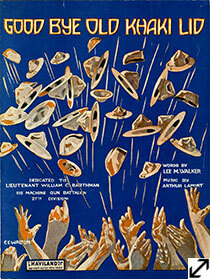 ), 1919. 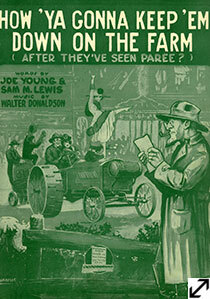 Lyrics by Joe Young (1889-1939) and Sam M. Lewis (1885-1959). Music by Walter Donaldson (1893-1947). Published by Waterson, Berlin & Snyder Co. Lent by Stefanie Kies. Mother Here's Your Boy!, 1918. 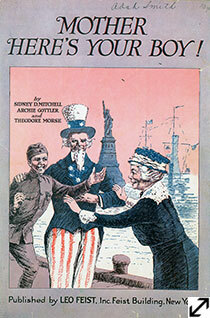 Lyrics by Sidney D. Mitchell (1888-1942), Archie Gottler (1896-1959) and Theodore F. Morse (1873-1924). 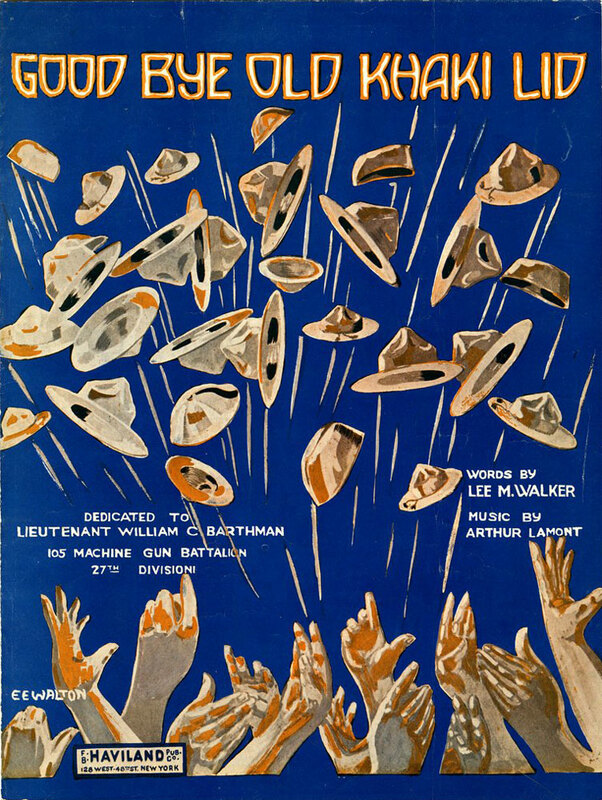 Music by Sidney D. Mitchell (1888-1942). Published by Leo Feist, Inc. Lent by Stefanie Kies. Good Bye Old Khaki Lid, 1918. Lyrics by Lee M. Walker. Music by Arthur Lamont. Published by F.B. Haviland Pub. Co. Inc. Greenwich Historical Society, William E. Finch, Jr. Archives. Gift of Karin Crooks.